Histologically, basal cell adenomas (BCA) are characterized by proliferation of basaloid cells in the absence of mesenchyme-like stromal component (present in pleomorphic adenomas). 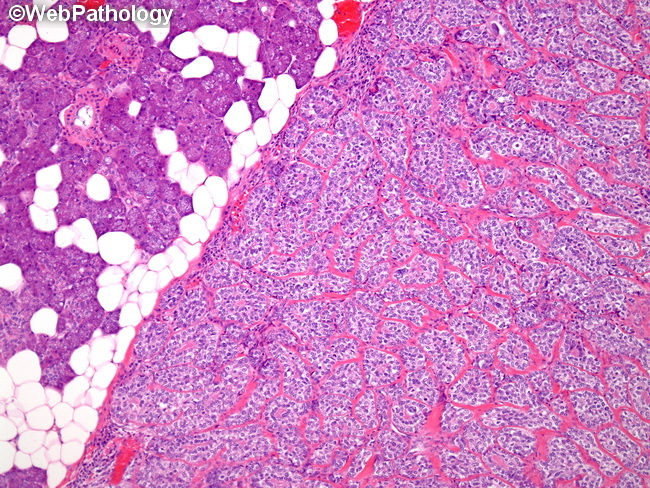 The histologic subtypes include solid, trabecular, tubular, and membranous (also known as Dermal analogue tumor); combination of patterns is not uncommon. This low power image of a BCA shows a sharply demarcated tumor (right side) composed of solid proliferation of basaloid cells surrounded by eosinophilic basement membrane like material. The left side of the image shows a normal salivary gland acini.